Clay doesn't have to be the main thing in a piece of artwork. Some time ago, I tried making frames for some two-dimensional work I had done. 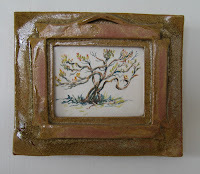 I made the first small picture in a class-setting dealing with tile and slab-rolled clay. It is a quick watercolor sketch I made in Hawaii. Constructing of the first frame includes creating a small raised frame in the back of the piece to accommodate the glass, the work and a backing. This piece has only tape holding the backing on, since it is a very small and lightweight. A peak similar to the one on the front located at the center top is repeated on the back to provide a hanging place using a small nail. In the place of tape on a larger work, holes could be made in the clay and, after firing, small nails or mounting triangles could secure the backing. Some expeimenting would need to be done to account for shrinkage. The second sketch was done in Guam and is an abstraction of an incredible panorama of beach, headland and surf that could be seen from the crest of a road. It is from memory. I painted it as if viewed from a window with a curtain of fabric drawn back. It's called "Room with a View". In this case, I built into the design a way of hanging the work by extending the frame, making holes in the extensions, threading and anchoring the multiple threads with knots at the bottom. It is also unglazed on the back and sealed with tape. This method of hanging opens all kinds of possibilities for interesting materials that become part of the design relating to the frame or the work it contains: Cording, leather, wire, rope, wood, reed, etc. There’s the old Chinese wheeze - something about “Every problem has a gift in it’s hands” which I have always filed in the Mental Sour Grapes Junk Drawer, but recently that very thing happened to me. 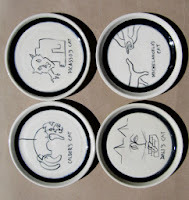 I made an 8-piece set of “Cat Plates” drawing the cats and the trim with black underglaze. They were porcelain and finished with a cone 6 clear glaze. In the final firing, the clear glaze reacted with the black underglaze in the banding resulting in a small area of a sort of wispy grey on the black. In another area, there was a tiny bit of black ‘creep’of fine lines into the white ground. So, I tried to duplicate the plate. That didn’t work. Too many variables: Clay density, throwing variation, glaze and underglaze consistencies, my memory...... I usually do extras when I do a whole series of one thing, but you guessed it. This time I didn’t. Okay. Lesson learned. I asked that the plate be returned to me in order to get it right. Previously, I had used an overglaze on clear-glazed ray guns that had been underglazed in bright colors. I thought I’d try using a black overglaze to correct the banding. I tested it first on a similar plate and not only did it work, but it worked seamlessly. New revelation! It is extremely workable, it is also extremely tinker-able. I can erase what I don’t like quickly with a damp sponge or Q-tip. If it’s dried, I can alter or etch lines into solid areas using a needle tool. I can write script using a fine liner brush. There’s much to be explored here. Took a few days, but looks nice. Tight as a snare drum. By the way, my kids were raised to know that you never, Ne-ver put your foot in the middle of a caned-seat chair unless you wanted endure mass screaming from the mother-unit. Just took a look at Tony Clennell's "Get a Handle on It" and "Taking the Macho Out of Bigware". Both are great videos. In 'Get A Handle on It', (back and front of the case are shown here) Tony shows several different design techniques for making a rolled handle, then does the clearest, easiest demonstration of pulling handles I've seen. He manipulates the clay with great technique and understanding of the material during the pulling process. The aesthetics of placement and attachment is also discussed and shown. 'Taking the Macho Out of Bigware' shows how you can make very large pieces using a two-part technique, marrying the top and bottom of thrown pieces to produce tall or volumenous vessels. It is such a sensible solution. Tony demos this approach in a clear, easy to follow process with several different forms. P.S. Don't miss the trick for finding the bottom of a big bottle. It's Priceless! 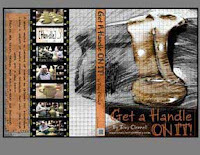 These two DVDs make a wonderful addition to Sheila Clennell's great video on creating handmade cane handles. It is also clear in directions and well shot with detail camera work that doesn't leave you wondering how something would look from another angle. Being able to make your own handles allows you to custom design them to match your work. DVDs in general are a great resource for your reference library. The good thing about owning a video is you can look at it over and over again. You can try the technique, then refresh your mind by viewing the process again. You can find all the videos beside view great looking pottery on the Clennell's website: www.sourcherrypottery.com, click on the number 4 for Videos. Last night I dreamed I was at my daughter-in-law's house (not her real house; this was a quirky dream-house) and she had a little 'droid dishwasher like a Rumbo floor vacuum. When you wanted to load it, you called it from underneath a cabinet and it rolled to the table for loading. When you were finished, you sent it away with the wave of a hand and it rolled to another cabinet, hooked itself up and washed the dishes. 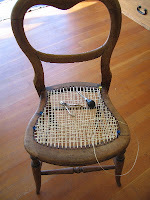 So today I've been redoing a cane seat on an antique chair. I love it when I can fix something; when I can take a broken thing and make it whole and useful again. It's great to do manual work and let your mind wonder and I began thinking about how I learned this skill. Many, many years ago, my husband and I were looking for durable chairs, We had a young family and the Navy was moving us about every two to three years. We decided to buy antique furniture because (1) It is usually solid wood and could be repaired or refinished. (2) It had a value should it get destroyed. Modern furniture, we learned the hard way, was not that great at withstanding the wear and tear of sea vans and virtually had no claimable value once it was torn up. So that is why we were cruising antique and junk stores in Portland, Oregon, where we were stationed at the time. We came across a dealer who had a set of oak pressed-back dining chairs. * The caned seats were in shreds. We were interested in buying the chairs, but learned it was very expensive to replace the seats. And it was even more difficult to locate a craftsman who could do it. After talking with the dealer a while, he remembered man who used to do seats but, he said, he was getting quite old, had arthritis and it was doubtful if he still worked at it. Then he suggested I might be able to convince the man to teach me how to cane seats. With that condition, we asked the dealer to hold the chairs. I convinced the cane man he needed to have me as a student and bought the chairs. During the course of the lessons, my teacher began talking about how He learned the craft. When he was a young man, he was taught by an itinerate chair-caner who had, in turn, learned it in prison as a rehabilitative trade. When my teacher had his lessons, his teacher, the ex-con, was very old man. When I had my lessons, my teacher was about 80 years old. So if you calculate the time-span of passing-down-the-skill through three people, to the time that I'm sitting here recaning a chair, it calculates to about 125-150 years from the time the convict/chair-caner first learned his trade to my working today. Now that's an amazing thing. I'm lucky to have found my teacher when he was a very experienced craftsman because he knew all the subtle nuances of the cane itself and how to manipulate it through the weaving process. He not only taught me the mechanics of the skill, but all the 'other' things it would take a long time 'doing' to learn. And that's probably true of most art. Brilliance may show it's flash at an early age, but it takes years of doing to arrive at the fullness and deep understanding of the craft in order to bring it together in a form recognized as a masterful execution. Skill, yes, all the techniques can be learned. Mastery only comes with time. *We still have the chairs and after umteen years of hard use and many, many moves they are now in the barn and guess what: They need new seats.